We are excited to announce that we are growing! Over the next few weeks and months you will see new tabs indicating additional subject matter we will be covering. Topics such as Faith, Fitness, Family and Food. Today we have something new for you, coming under the Family umbrella, Homeschooling. Homeschooling is officially underway in the Brown home and we will be sharing as we go along. See below how we fared during our first week. It was rough, but we survived the first week of homeschool. Well, kinda sorta, lol! After years of thought, months of research and weeks of preparation, homeschooling at the Brown's has officially started. I sorted through endless information to construct a pre k curriculum that met our needs. The posters made and laminated, games gathered, endless copies made, supplies organized and many, many prayers offered up! We are ready, ready and ready! I have fluctuated between bouts of inspiration and deep reservations. What if I can't teach her to read? What if I can't teach her math? What if I destroy her confidence? Then inspiration would strike again in spite of my concerns and I would feel as if I was born to homeschool. Day 1: The night before the our first day of homeschool. I accepted a play date at my house at the time we should have been homeschooling. Zj loves company. Looking back in hindsight, I think I was gun shy. Scared to get started. After the date, which was extensive, while I cooked dinner, we completed our allotted components for the day. Zj was excited. Day 2: Day two went by without a hitch. My confidence was growing and I was feeling like I could really do this thing. ZJ: Wait, wait Mom Mom, I have something to say! Me: I closed the book, "Yes, Zj?" Me: Ok, is that it? I like my teacher, Miss Tonya at school and I like you at home. I like when we do work at school and I like Mommy at home for fun and crafts. I don't want to do school at home with Mommy. Just fun stuff. Did you catch that?! My newly minted four year old just said she didn't want school at home. She wanted to keep home and school separate. Whaaaaa??!!! If I wasn't so into my perfectly constructed lesson plan and determined to execute I would have realized that maybe I need to tweak a thing or two or even slow down so we could transition smoother, but I was on a mission. I just explained our current circumstances, asked her if she understood. She said, "Ok, ok, ok" and we moved on. Or so I thought. Nothing went smoothly from this point forward. Everything we worked on including the part she said she liked with Mommy, the craft, was fraught with obstacles. Zj was all over the place, playing around, getting distracted and not paying attention. I would stop or redirect, correct and explain. She would apologize, but minutes later be back at it. We were on a slippery slope. Finally, I called a time out on the craft. She said she was sorry again, but I couldn't take it any more and told her that I was done and started packing up. She apologized again as she sat in time out upset because I wasn't accepting her apology so she could finish her craft. I explained what it meant to be sorry and that her behavior was not lining up with her apology. She cried and cried. I wanted to cry too. I had worked so hard and it seemed unappreciated. I was torn between being upset for her and being upset with her, but I was not going to cry. I sat at the table not looking at her and packed everything up as she pleaded with me to say everything was OK. Eventually she got up and went to her room. We both needed a time and space. After a half hour, the responsible mother in me need to check to make sure she was ok back there, even though I was still upset. I peeked into her quiet room and there she was curled up in fetal position on her bed with the covers over her, lights on. Zj never lays down. Not even when she is drop dead tired. My heart softened. I debated within myself whether I should wake her for dinner. She was asleep at 5:30 pm. I decided dinner could wait, surely she was just napping. I moved her to make her more comfortable and found the bed soaking wet where she must have cried herself to sleep. So many emotions swirled inside of me. I kissed her cheek and turned out the light. I cleaned up waiting for her to wake up. She never did and by 8p with all that had happened that day I went to bed exhausted and still a mix with emotion. I tossed and turned all night. I awoke the next day to find I was still upset and Zj was still asleep. It was only after talking it out with hubby was I able to let it go. He's a wise man. Just in time too, because here she comes, "Morning Mommy", bright eyes, smiles and arms open. "Good morning Stinka. I love you!" "Love you too Mommy." That afternoon on the way home from nursery she hollers excitedly from her car seat, "Mom Mom, what are we doing at school home today?" Complete with bright eyes and clapping hands. I'm sure the homeschool veterans and experienced parents would love to chime in and I would love to hear from you. Please keep your comments positive and constructive. Also, please keep an eye out for Part 2 of this post, "What I Learned My First Week Of Homeschooling". You can sign up here so that you never miss a post. You might find this post at any of these parties! 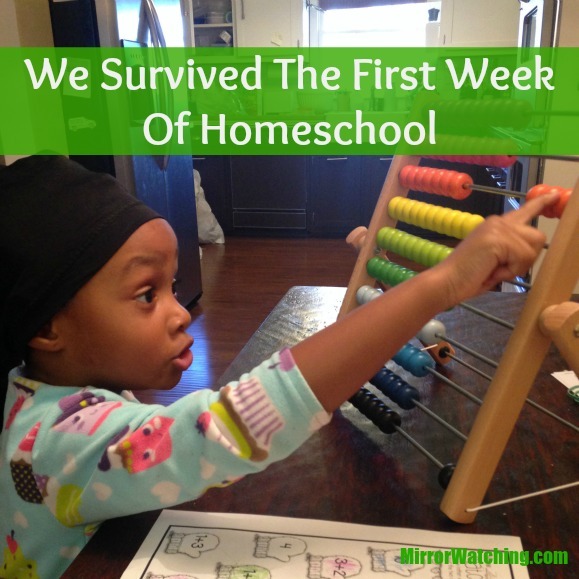 What kinds of challenges did you face when you started homeschooling? Hey Susannah, drama aside it really was fun. Thank you Heather for the encouragement. I will be hanging in there. Awwwww this was a heart touching share. I commend you for homeschooling. Although we do lessons I don't think I could mentally handle a full on routine. I'm glad that rocky day didn't deter you or Zj. Can't wait for part 2.. Thanks MJ. YOUR ENCOURAGEMENT IS VERY MUCH APPRICIATED. Thanks for inviting us on this journey with you! I enjoyed reading about the highs and lows, and can appreciate the lesson you also gleaned from this--a transition period is key. Golden advice I hope to remember as I patent my young toddler! Thanks, Gina!! Continued homeschooling success to u and Zj! Thanks so much Debbie. Transition, transition, transition, ok! Lol! Very cool. My niece gets home schooled and she is excelling. Thanks Holly Fayz for popping by! It sounds like you are going to do a great job. Hang in there, and don't let the rough days steal your joy! We're rooting for you! Awe thanks Nicole. I appreciate the encouragement. As a homeschooling mom, there are always those rough days. I think it is really important to know your why behind homeschooling to help push you along on those difficult times! Thanks Tia Lea, I guess I didn't expect and your advice is spot on. Remember the "why". Congrats on your first week of homeschooling--that is quite the accomplishment. It sounds like in spite of the ups, downs and learning-curve, you daughter is learning and enjoying the experience. I always admire the dedication of parents who home-school. Wishing you and your family a blessed week! Thank you so much Jed. You and your family be blessed as well. Congrats! Home schooling is quire a commitment. I am inspired by this because I have often thought of pulling my child out of public school so that I can impart things he would never learn in a public school system. LV have you considered supplementing his public education with homeschooling in areas that are not covered in school. I know a few people who are happy with the results. Way to go! Homeschooling has been on my mind a lot lately, but I am pretty much split down the middle at this point. I'm planning to revisit the thought two years from now. Homeschooling is a lot to think about and should not be considered lightly. Let me know if you need good resources on the subject. Thanks Sheena! I take my hats off to you Homeschooling moms. My daughter started preschool this week and I'm misisng her already. Awe Nicole, I remember my daughter's first PMO. I SAT AND CRIED IN THE PARKING LOT FOR HALF AN HOUR. Parent drama, right? What a heartfelt post. I think its awesome you are doing the homeschool thing but it is a process for you and for your child. The reason she cried herself to sleep because it was a drastic change...so she couldn't decipher mommy from teacher yet...she was a little confused. She is still young and adjusting to change but make sure you try to keep mothering and teaching separate just a little, I know its hard because its all in the same home and environment but yes maybe create some kind of system to where she starts understanding the difference in being home & schooled...and being at home. I look forward to your journey. 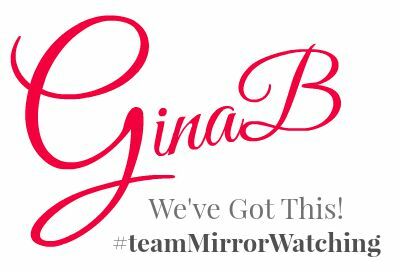 Hang in there Gina! It will all be worth it. I definitely take my hat off to parents who homeschool. It is NOT easy. And I think you also have to know your child to determine what kind of environment will work best for them and their needs. My sister has homeschooled all three of her children (8, 6, 4) and I definitely see the benefits. Thank you Julian. Thanks for encouraging me with your sister's success. Much appreciated. Such a heartwarming story! I'm curious as to why you've chosen to home school. I don't know much about homeschooling, but I've always been curious about it. Wishing you the best as you continue with your homeschooling journey! Oh Dana there are some many reasons but I guess the two in the fore front of my mind having a hand in developing a love for learning foundation and being able to respond to her curiosity and incorporating it into her studies. Thanks Dana! 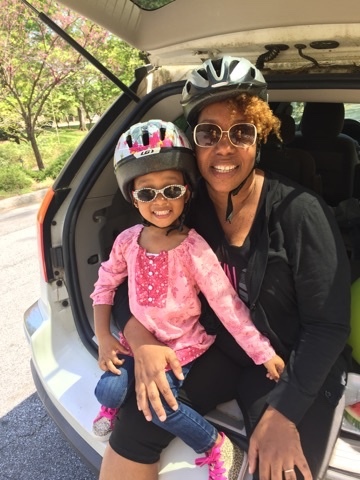 Sounds like this is a learning experience for mama and daughter! I love your authenticity in sharing your week with us. Inez, this is, most definitely, a learning curve for both of us. I love that we are doing it together. Thank you. It's a transition that is going to take patience and perseverance. As much as I believe home schooling would be best for one of my children, especially with her travel schedule for athletics, I don't think I have the patience for it just yet and she's much older than 4! Take heart, you're jumping out there and it'll be worth it. Thanks Anitra. You have to know yourself. Lol! Awww welcome to the homeschool family. It definitely has it's ups and downs but the pros for us have far outweighed the difficulties. Hang in there. It'll take some getting used to. If you have any co-ops in your area, they have really helped us and the kids (I've also written a few homeschooling posts). Thanks Christine. I've seen a couple of your posts and gleaned from them. Never homeschooled my children. But I do teach kindergarten and I know my children were better off in school. They thrived there where I know myself, they wouldn't have thrived at home. I can teach other children, just didn't want to teach my own. They all graduated, live responsible lives and we all survived just fine. Keep up the good work and take one day at at time. I love that you are a teacher saying it wasn't for you or your girls. Knowing ourselves says U.S. A world of disappointment. Thanks for popping by Michelle! We've absolutely been there! The first year of homeschooling was the hardest we constantly danced between doing just fun hands on crafts and science experiments and doing all book work; usually until we cried. The fears never go away completely but they do lesson as you see them grasping facts and gaining skills. Give yourselves plenty of grace and time to adjust. We're wrapping up our 4th year and we just LOVE homeschooling. There are always ups and downs but the benefits of spending each day with all of my boys and watching them grow strong bonds with us and each other is so worth it. We have so much fun together and they're always learning. Thanks so much for the encouraging words I totally agree with you. Thanks for sharing you family's journey with me. Kudos to you and your daughter for being troopers. I don't have children of my own but I always said that if I did, I would homeschool even though I'd be clueless lol. Especially at my age now, I would definitely do it. I never thought about kids wanting to keep school and home separate. Yeah Jonna?? That was a very interesting dynamic that I didn't contemplate. I'm an older Mom too and just as clueless. Thank God for the Internet. Lol! Thanks for your support. I won't give you tons of advice because you're hearing some good advice. I'll chime in though from the position of a mom of four who has an 11th grader and a 9th grader and a 6th and 5th grader this year. I realize I only officially have one year left with my oldest. We've homeschooled every minute- from the time we sat down when the oldest were 3 and 4 and did "Gather at the Table Time" where we learned letters and numbers and read books to high school now. I do not regret one second of one day we've spent together. Were there hard days? Absolutely. We all love to tell the story of the day my son pitched an hour long fit because I told him to read his book chapter alone that day instead of me reading it aloud. After the hour fit, he finished the reading in about fifteen minutes. Or there's the time I had a 45 minute showdown with my kindergarten child who wouldn't dictate one sentence to me- ONE sentence! There are days I'd tell my husband when he came home that I was dreaming of the big yellow bus that could swoop in and take them all away. But much more memorable than those days are days of waking up slow and cuddling while we read books; of being the first one to hear my children read for the first time; of great discussions that happen at the most inconvenient time, but since you're home to have them, you have the opportunity; of happy, happy times when all four kids get going on something funny as we're all getting together for lunch, of reading aloud together. Yay! Would love to see your posts in the Practical Mondays Link Up:) Pls do share your stories!